This post was done in partnership with Wirecutter. When readers choose to buy Wirecutter’s independently chosen editorial picks, Wirecutter and Engadget may earn affiliate commission. 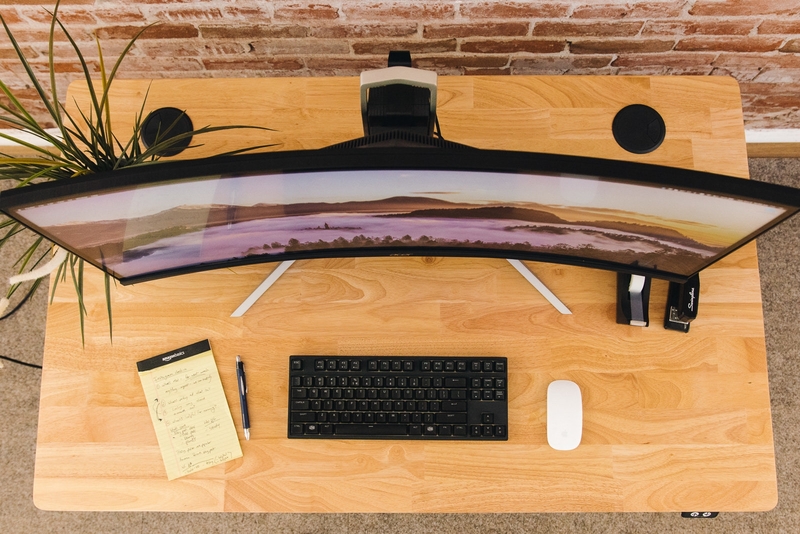 Read the full ultrawide monitors guide here. 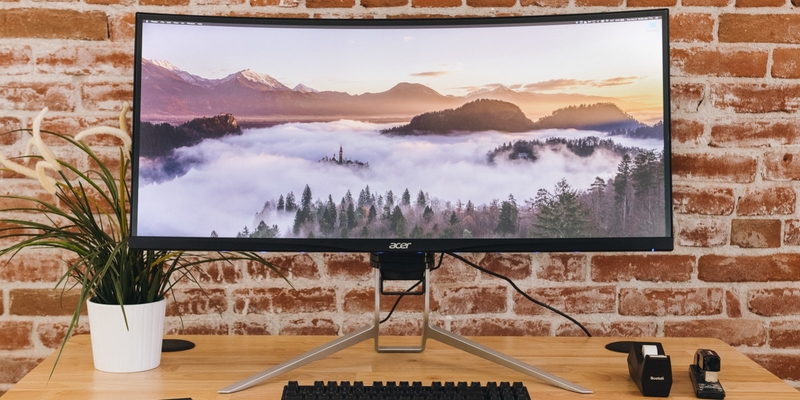 After spending 10 hours researching monitors and then 25 hours testing five, we found that the Acer XR342CK bmijqphuzx (yes, that’s the full model name) is the best ultrawide monitor. The 34-inch, 3440×1440-pixel display is as color accurate as we’ve seen in an ultrawide. 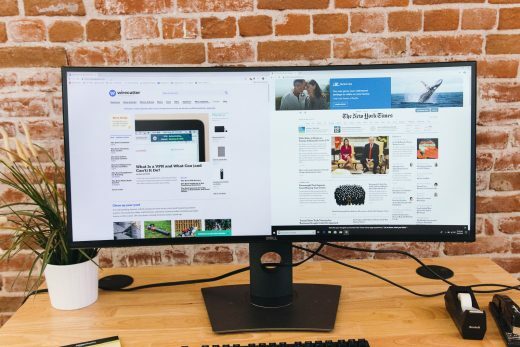 The display’s wide resolution makes it an excellent replacement for a dual-monitor setup, provided you’re willing to pay between $600 and $700. The viewable space of the Acer XR342CK is just short of what you get from two 24-inch 1080p monitors. This monitor is huge, and the adjustable stand lifts, tilts, and swivels. 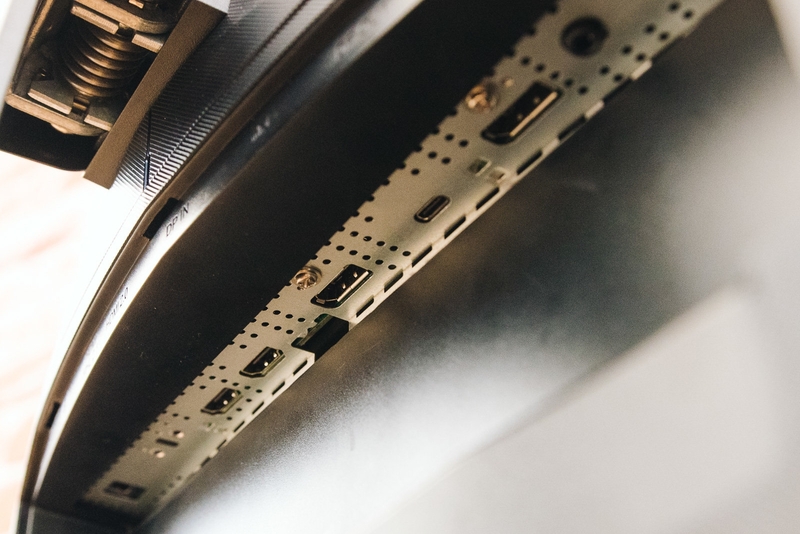 Its HDMI, DisplayPort, and MHL ports offer plenty of ways to connect devices, and the four-port USB hub lets you easily keep cable clutter to a minimum. 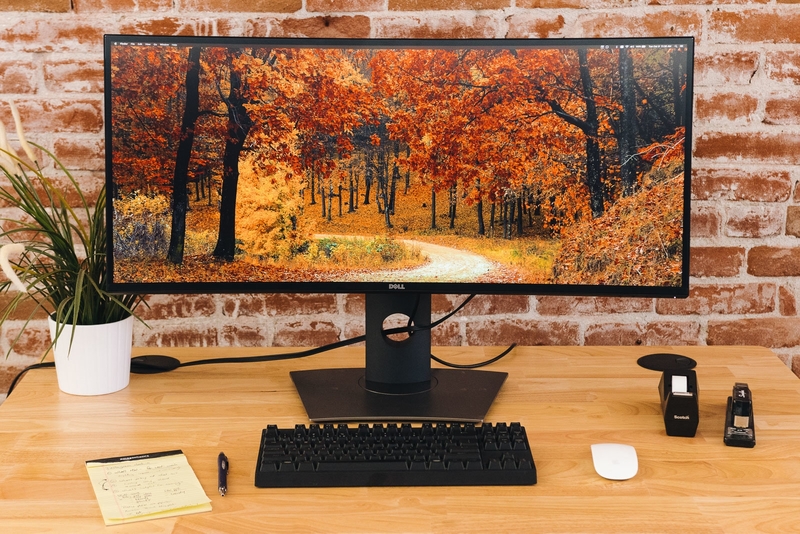 The XR342CK is the only ultrawide in this price range with a USB-C port that outputs 60 W, so you can connect and charge a modern MacBook Pro or Windows laptop with a single cable. And it supports a few nice-to-have features such as a slightly faster-than-normal 75 Hz refresh rate and AMD’s FreeSync. But the picture-by-picture mode on this Acer model doesn’t work as we expect, making the XR342CK a bad choice for two-computer setups. Although this model has an HDR mode, we recommend leaving that off because it makes everything look worse. And its three-year warranty doesn’t cover pixel failure like the warranty for our runner-up, the Dell U3417W, does. An ultrawide monitor can offer a more immersive experience in games, provided the game you’re playing supports it. But most non-gaming-specific ultrawides don’t have advanced features such as a high refresh rate or Nvidia’s G-Sync adaptive sync, which prevents screen tearing in games by matching the frames being rendered on the display to an Nvidia video card. AMD video cards have a similar feature, called FreeSync, which is more commonly included with ultrawides in this price range, such as our pick. We plan on looking at gaming-specific models soon, but if you don’t play a ton of competitive first-person shooters, any of the monitors in this guide will work fine. 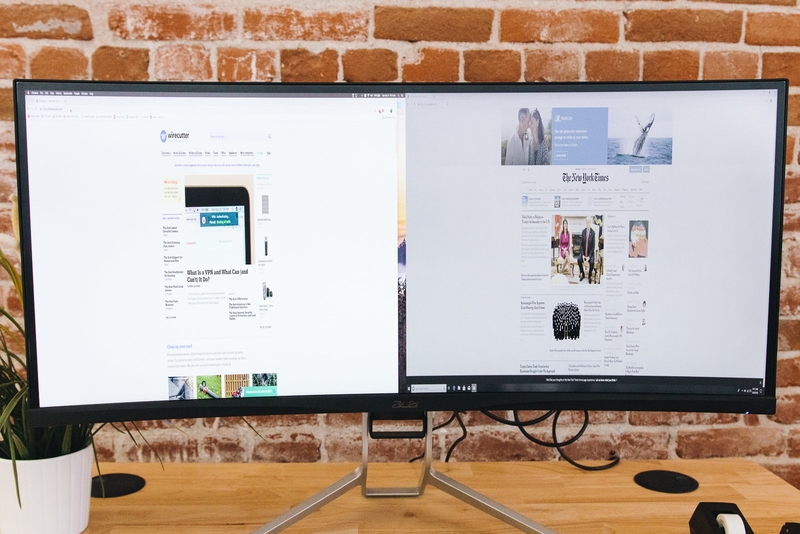 Ultrawide monitors usually use IPS panels with excellent viewing angles, but with the monitor’s curve, you may find little pockets of odd color variations if you don’t keep your head directly centered (which is how we tested each monitor’s color accuracy). For example, on every monitor we tested, blacks and whites appeared as a washed-out gray in the corners. The effect never bothered us during the workday, and we never noticed it when playing games, but the backlight bleed might be noticeable during dark scenes in a dark room. We also found that notifications in macOS—which appear in the top-right corner—often appeared washed out and hard to read if we didn’t sit perfectly. When you get your monitor, we suggest loading up this YouTube video in full-screen to see if the bleed bothers you. 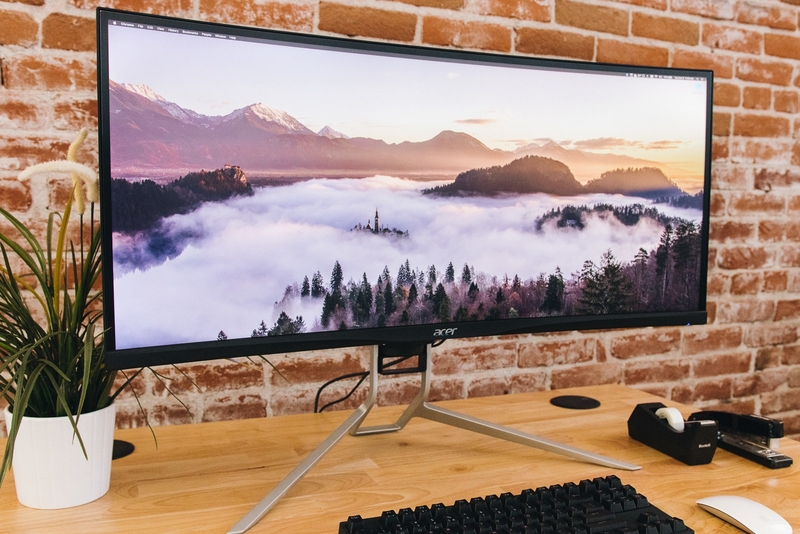 With its 3440×1440, color-accurate, 34-inch IPS screen, the Acer XR342CK bmijqphuzx is the best ultrawide monitor. It usually costs less than $700, the stand lifts, tilts, and swivels, and it has plenty of ports, including a USB-C port. But you’ll have to deal with Acer’s lackluster warranty, which doesn’t cover common problems like dead pixels, as well as a poorly designed on-screen display that makes it easy to press the wrong button. The Acer XR342CK’s panel has a 75 Hz refresh rate, slightly faster than the Dell U3417W’s 60 Hz display, though we doubt anyone would notice the difference between the two. Unlike the Dell, the Acer has FreeSync support, which makes it a good option if you play games and have an AMD graphics card. It also has an HDR compatibility mode, but in our tests the mode failed to add to the experience with HDR-compatible content and usually made everything look worse. The XR342CK’s contrast ratio was 988:1, the closest to our target of 1000:1 of any ultrawide we tested. The U3417W came in at 874:1, but we didn’t notice a difference between the two when we placed them next to each other. A poor contrast ratio is most noticeable when you’re watching dark scenes in movies, and the Acer and Dell monitors both performed admirably (except in the corners, where ultrawides exhibit higher-than-usual amounts of backlight bleed). The XR342CK had a gamma of 3.0785, a higher result than we like to see; it could cause some shadows to appear too dark. 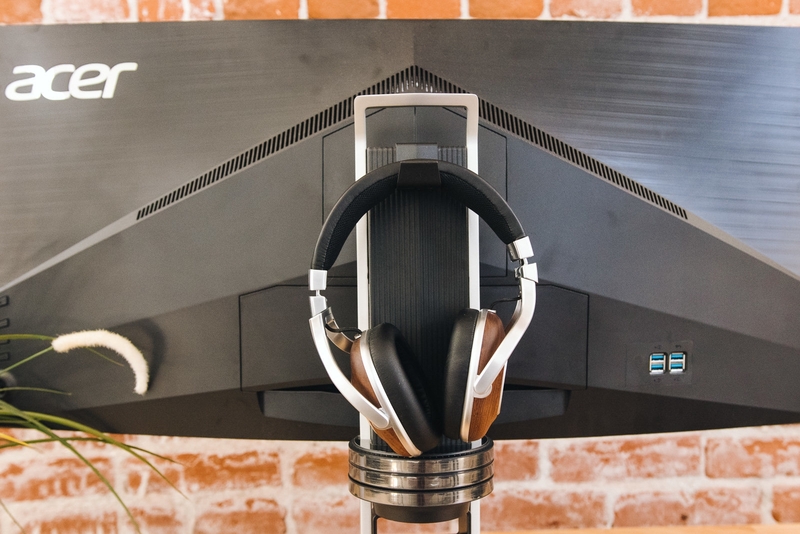 Gamma was the only test where the Dell U3417W performed better than the Acer XR342CK, but with the two placed side by side it was nearly impossible for us to see a difference between the shadows. The LG 34UC88-B was noticeably darker with less pop in the colors. As for grayscale color error, the XR342CK’s average DeltaE 2000 value was 1.3283, which is excellent. This score—the best of any ultrawide monitor we tested—means that its colors are neutral, lacking a blue, green, or red tint. Colors don’t appear washed out, and there’s not much of a difference between brighter highlights. The Dell’s DeltaE 2000 value was much higher at 3.8067, and in our tests that monitor had a slight blue tint that was apparent to the eye. On our ColorChecker test, which assesses values through more than 100 colors, the XR342CK had an average DeltaE 2000 value of 1.63, better than every other ultrawide monitor we tested. It had some red and orange peaks, which means that images with lots of red and orange tones may look less accurate than others, but that effect wasn’t noticeable when we used the monitor. It covers 99.71 percent of the sRGB color gamut, a couple of points better than what we saw on the Dell U3417W. You can adjust the height of the Acer XR342CK up and down within a 5-inch range, tilt it forward and backward, and swivel it left and right. 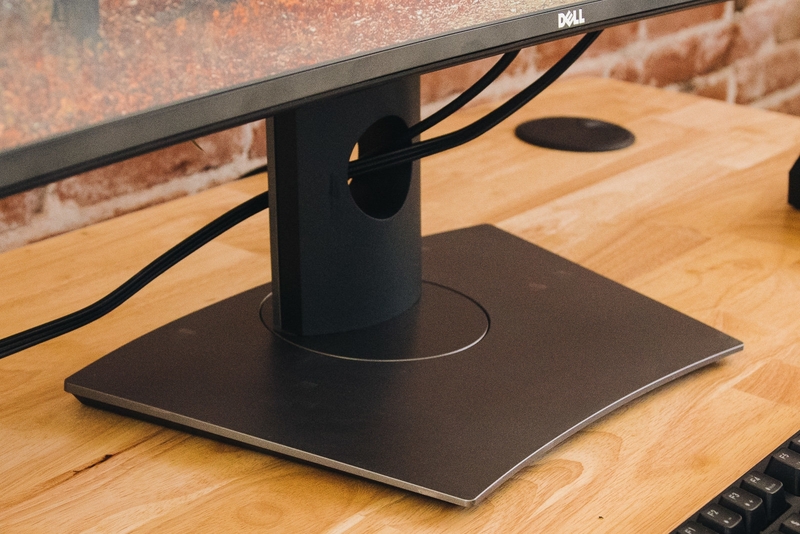 The Dell U3417W offers the same adjustments, but the vertical range is a half inch less. The Acer’s quasi-futuristic three-point stand adds to the overall depth of the monitor, so you’ll need a deep desk to fit it comfortably. The Dell’s stand, in contrast, is much smaller, so you can push that monitor farther back on a desk. 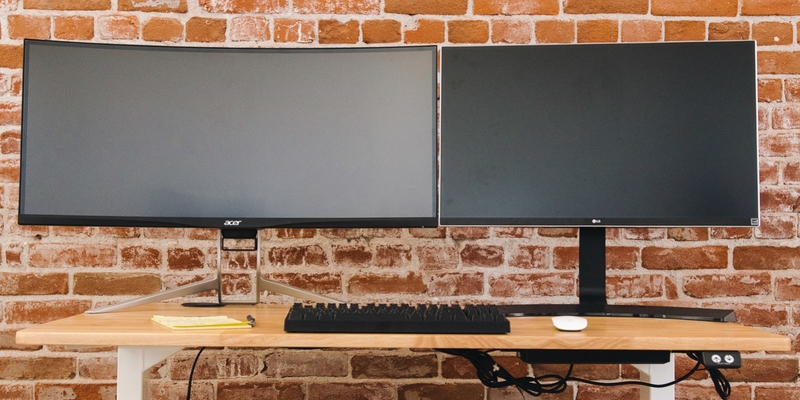 Both monitors have an area to route cables through the stand, and Acer includes a panel to cover up the inputs on the back if you can’t handle the idea of ports being potentially visible to passersby. 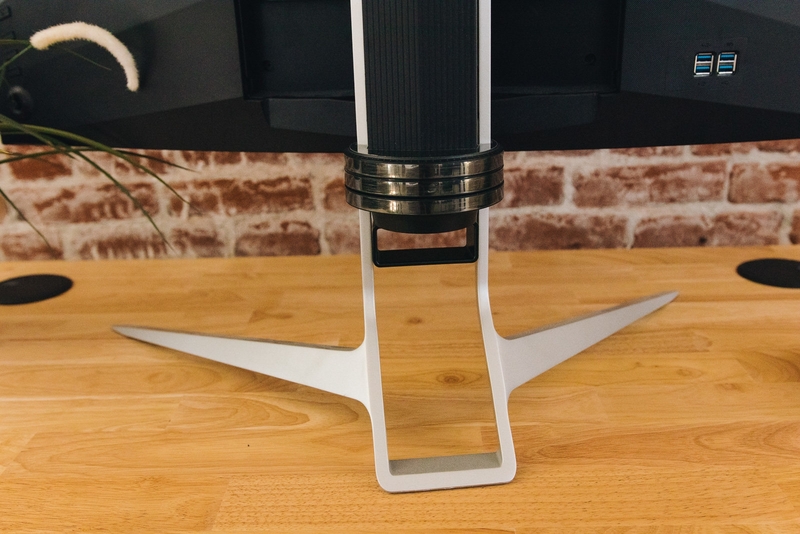 The XR342CK is VESA compatible if you want to connect it to a mount or monitor arm; Acer also includes a wall-mounting bracket it you don’t want to deal with the stand at all. On the back of the monitor you can install an optional headset hook, which gives your headphones a permanent place to live when you aren’t using them. 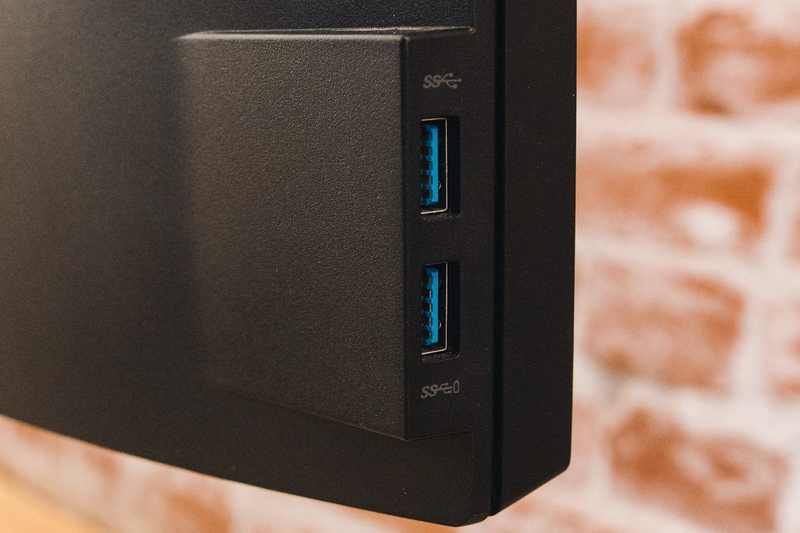 The XR342CK includes most of the ports you need on the back, facing down, including HDMI 2.0, MHL 2.1, DisplayPort 1.2A, Mini DisplayPort, and a DisplayPort output if you want to connect it to another monitor. On the rear are four back-facing USB ports for connecting USB devices, such as a keyboard, mouse, or storage device. 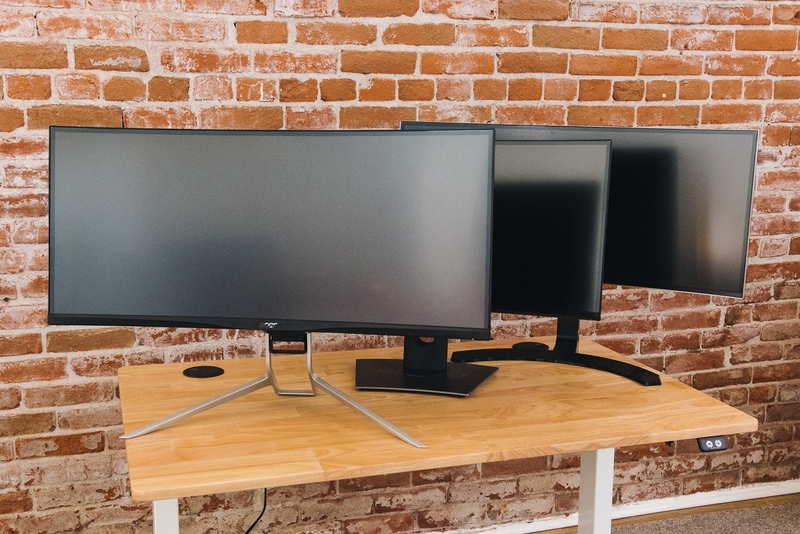 The XR342CK is the only monitor we tested with USB-C support. 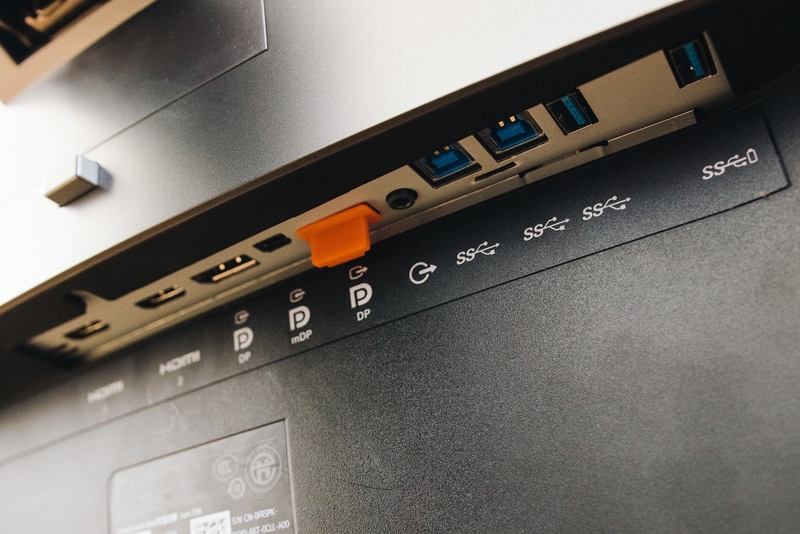 With this you can connect a laptop (such as a MacBook Pro or Dell XPS 13) to the display with one cable that can also charge the laptop. The USB-C port outputs 60 W of power and also connects the computer to the XR342CK’s USB hub. The XR342CK doesn’t have a USB-A upstream port, so if your computer lacks a USB-C port you’ll need a USB-A–to–USB-C cable. Acer includes an MHL cable, an HDMI cable, a DisplayPort cable, and a USB-A cable in the box. Acer offers a three-year limited warranty under which it will either repair or replace the unit at its discretion. Unlike Dell and some other monitor companies, Acer doesn’t offer a bright-pixel or dead-pixel policy, so you should check for dead pixels as soon as you get your monitor and return it to the retailer if necessary. And although Acer offers phone and chat support, its support library, forums, and documentation aren’t as detailed as Dell’s. The Dell’s DeltaE gamma value was excellent at 2.461, better than the Acer’s 3.0785 but not a noticeable improvement to our eyes. Its DeltaE grayscale color error was high at 3.8, especially next to the Acer’s 1.3283. The Dell has a slight blue tint that isn’t noticeable if you’re working in productivity apps like Microsoft Word or Excel, but you can see it if you look for it, especially in black-and-white photos. We noticed the blue tint only after putting the Dell and Acer monitors side by side. The LG 34WK95U-W is the first 5K ultrawide, with a 5120×2160-resolution display. It’s expected in fall 2018 with a hefty retail price of $1,500. We plan on testing it once it’s available. 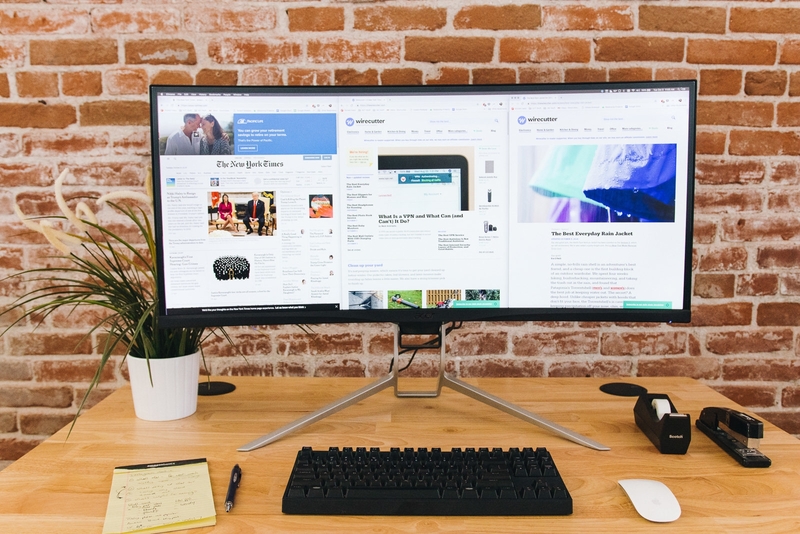 Samsung’s C34J79 34-inch 1440p ultrawide was announced at the CES 2018 trade show and is expected to release in fall 2018. Its Thunderbolt 3 port, fast 100 Hz refresh rate, AMD FreeSync, and VA panel suggest that it’s better suited for gaming and media consumption than productivity, but we’ll keep an eye on it after release. We plan on looking at gaming-specific ultrawides soon. These monitors have high refresh rates between 100 Hz and 140 Hz, and they feature G-Sync or FreeSync adaptive sync. This group includes models like the Acer Predator X34, Asus PG348Q, and HP Omen X. There aren’t a lot of 34-inch, 3440×1440 ultrawides available. And many models are specifically for gaming and include additional features that add to the price but aren’t essential for most people.